Businessman Arron Banks has been challenged to explain where the money for his Brexit campaign came from. Mr Banks is the subject of a police probe into claims he was not the "true source" of £8m loaned to his Leave.EU campaign in the 2016 EU referendum. The Electoral Commission referred the case to the National Crime Agency, which said potential criminal offences may have been committed. Mr Banks told the BBC's Andrew Marr the money came from his UK businesses. Foreign donations to political campaigns are banned under UK law. Mr Banks has faced claims that money to fund Leave.EU came from Russian sources - something he has repeatedly denied. "There was no Russian money and no interference of any type. I want to be absolutely clear about that," he told the BBC's Andrew Marr show. "The money came from Rock Services which was a UK limited company." Mr Banks was also asked about a report in the Sunday Times that he would back Remain if the 2016 referendum were re-run. He replied: "What I said was that the corruption I have seen in British politics, the sewer that exists and the disgraceful behaviour of the government over what they are doing with Brexit and how they are selling out, means that if I had my time again I think we would have been better to probably remain and not unleash these demons." The Electoral Commission says it suspects the money came from Rock Services parent company Rock Holdings, which is registered in the Isle of Man and so "could not lawfully make any donation or be a party to any loan to Leave.EU". The Commission referred the case to the National Crime Agency because it has the ability to investigate financial transactions in the Isle of Man, something that is beyond the scope of the electoral watchdog. Mr Banks denied Rock Services was a "shell company" that did not have sufficient funds to be the source of the money for Better for the Country (BFTC), which ran Leave.EU. In its report on the case, the Electoral Commission said: "We have reasonable grounds to suspect that Rock Services did not fund the payments of £8m it is said it made to BFTC from its UK-generated income". 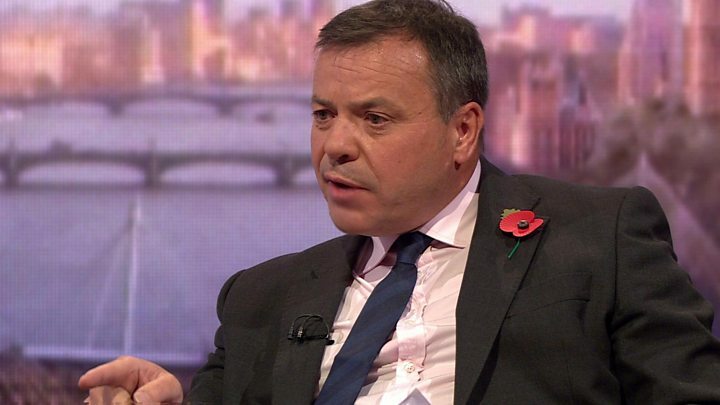 Has Arron Banks' story changed? Mr Banks has given two apparently different explanations about the role of Rock Services. In his evidence to the Culture Media and Sport Committee in June, Mr Banks described Rock Services as "just a service company". He told MPs: "The actual loan came from one of my companies that was delivered in." In his Andrew Marr interview he again described Rock Services as a "service company" but said it was a UK limited company and the £8m donation came out of "insurance business written in the UK". He said: "We turn over £250m of premiums, it's a sizeable business" and added Rock Services has "all sorts of revenues" but did not detail them. Labour MP Ian Lucas, a member of the Commons culture committee that questioned Mr Banks in June, told BBC News: "There are a number of contradictions that arise from the interview today but I think, fundamentally, the question is that Mr Banks still hasn't given us a proper explanation of where this money came from." In interviews and at select committee hearings, Arron Banks likes to be seen as cheeky and unflappable, almost as if he relishes these appearances. He didn't seem to be enjoying the experience today, often looking rattled during heated exchanges. The money trail was at the heart of the interview. Mr Banks looked most uncomfortable when probed about the relationship between his companies. Despite repeated questions, he insisted the funding he provided for the Brexit campaign came from his UK based company, Rock Services. But when Andrew Marr highlighted Mr Banks' own evidence to a committee of MPs - which apparently differed from this account - he appeared flustered. "I haven't seen the actual transcript of that. I will go back and look at that, but I'm telling you that the source of the funding was Rock Services, " he said.. Although Arron Banks insisted that he had disclosed the accounts of his Isle of Man company, Rock Holdings, to the BBC, Andrew Marr replied that they were "redacted" and showed very little. The questions about where the £8m donation came from will linger. Arron Banks denies all wrongdoing, but as the criminal investigation now gets under way, he can expect an uncomfortable few months of financial scrutiny. Where does the investigation go from here? The National Crime Agency said: "This is now a live investigation, and we are unable to discuss any operational detail." Separately, the Metropolitan Police is examining whether to launch a criminal investigation into whether Leave.EU broke its £700,000 spending limits, after a file was handed to it by the Electoral Commission. The Met is also examining electoral law breaches by the official Vote Leave campaign. And, in another development, Mr Banks has been accused of misleading Parliament over links between Leave.EU and his insurance businesses. The Observer says it has seen internal emails leaked by former employees of Eldon Insurance, another of Mr Banks's companies, and Rock Services that show they worked on the Leave.EU campaign from their company offices. Conservative MP and chairman of the culture media and sport committee, Damian Collins, told The Observer the leaked e-mails appeared to "flatly contradict" what Mr Banks had told his committee in June. Mr Banks told Andrew Marr: "I can say that was reported to the Electoral Commission, and people who did work for Eldon were transferred over on short-term contracts legally, and it was reported through the Electoral Commission in the right way. "You are talking about emails that were stolen from us." The Electoral Commission said Leave.EU "did not report spending on or donations from Eldon". On Tuesday, the Information Commissioner, Elizabeth Denham, will appear before the culture committee to announce the outcome of an inquiry into claims that Eldon shared customer data obtained for insurance purposes with Leave.EU, potentially breaking data protection laws. "We are also investigating whether Eldon Insurance Limited's call centre staff used customer databases to make calls on behalf of Leave.EU in contravention of the Privacy and Electronic Communication Regulations 2003," the ICO said in an interim report in July.